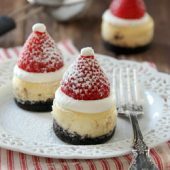 Oh I just looking forward to trying these adorable mini Santa Hat Cheesecakes. Love anything cheesecake!. I got to get me one of these pans. Would make my life so much easier. Thank you for the great recipe. Mini Santa hat cheesecakes for sure! I liked “Baked by Rachel” on FB! I follow “Baked by Rachel” on Pinterest! I follow “Baked by Rachel” on Instagram! I follow “Baked by Rachel” on Twitter! 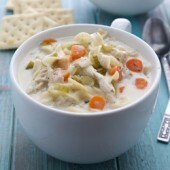 I pinned this recipe on Pinterest! I also shared this post on FB, but I have no clue how to post the link to my share. It is on my timeline though. New addition to my Christmas favorites. The Santa Hat mini cheesecakes for sure! And all things cheesecake or chocolate. 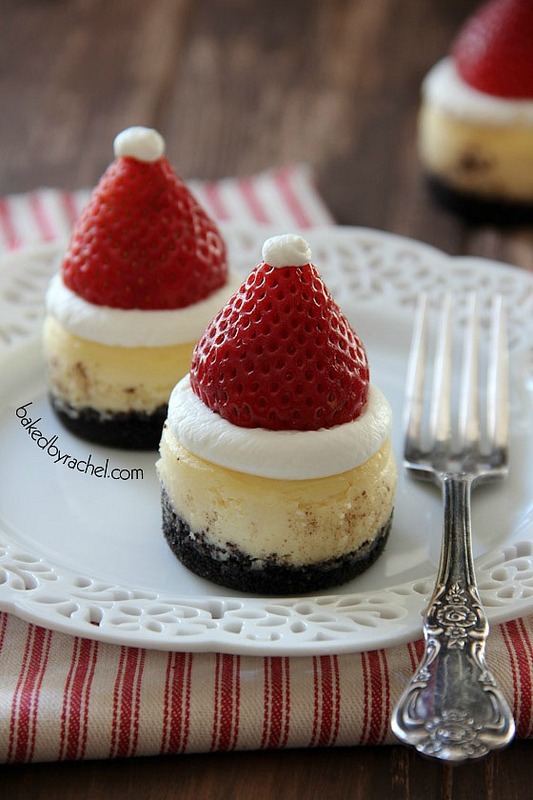 I want to make the Mini Santa Hat Cheesecakes. I’m most excited to try the Mini Bailey’s Cheesecakes with chocolate whipped cream! My mom loves Bailey’s, so I’m thinking she would like these too. Thanks for all these adorable recipes and this giveaway! I’ve also subscribed by email! Thanks again! My favorite – mini cheesecake santas. Love them…. These Santa cheesecakes are a MUST for my family! 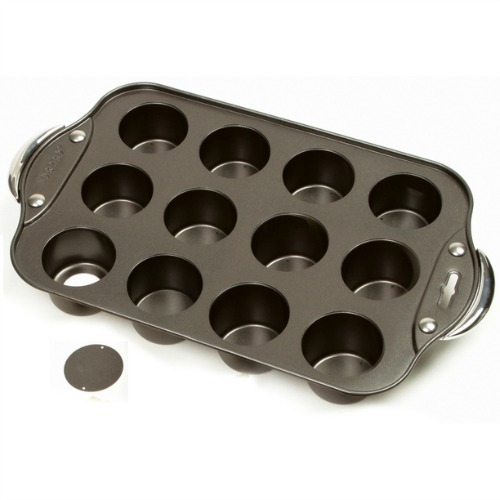 I would love to try the mini cheesecake pan. Thank you for your creative cooking ideas! 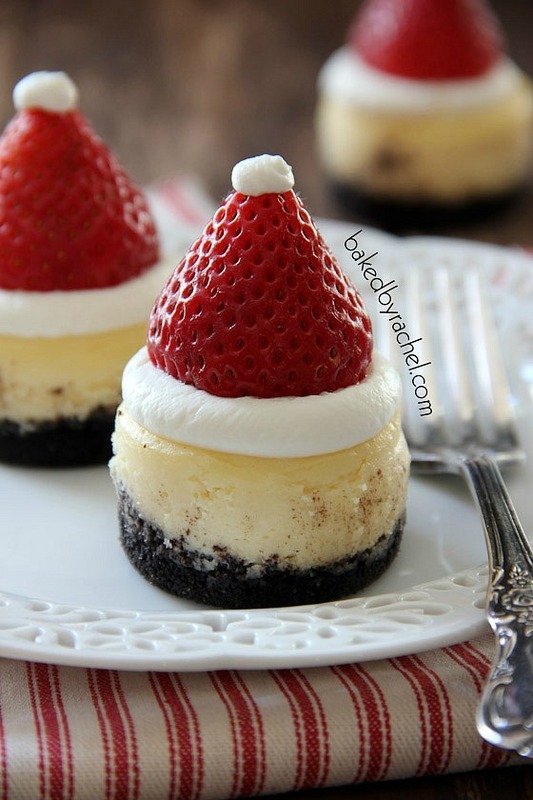 I’m dying to try these mini Santa hat cheesecakes!! My son will flip for them! 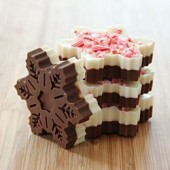 I liked Baked by Rachel on Facebook! I’m excited to try making you Santa cheesecake hats. They are too cute. def want to try the cookies and cream cheesecakes! These are so adorable & they look delicious!! Love (and shared) them! 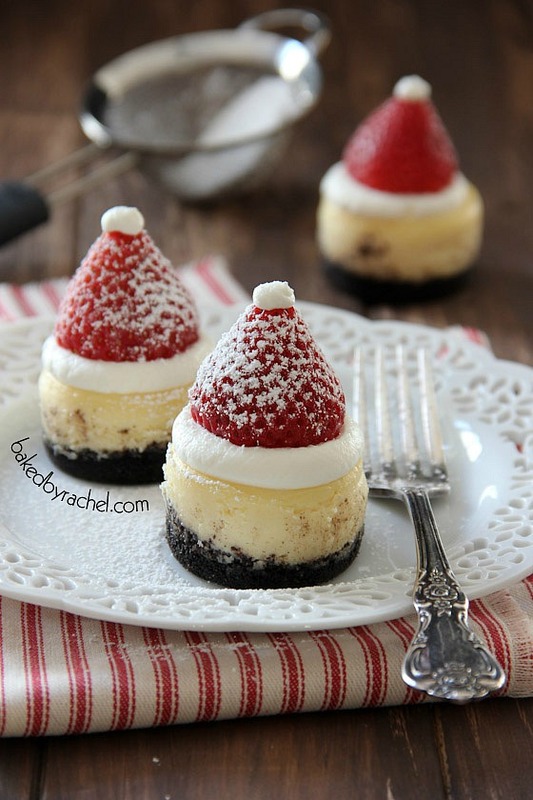 I cannot wait to try the Mini Santa Hat Cheesecakes! So cute and fun! I want to try the eggnog recipe! 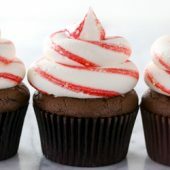 The mini santa hat ones for sure – they are soooo cute and i bet they taste divine! I would like to try the mini Red Velvet Cheesecakes. I made the mini oreo cheesecakes over the summer and they turned out amazing!! Now I’m looking forward to making these mini santa hats for the company I intern at! they are so cute for a holiday party! I would love to make these Santa hats. They are so cute.